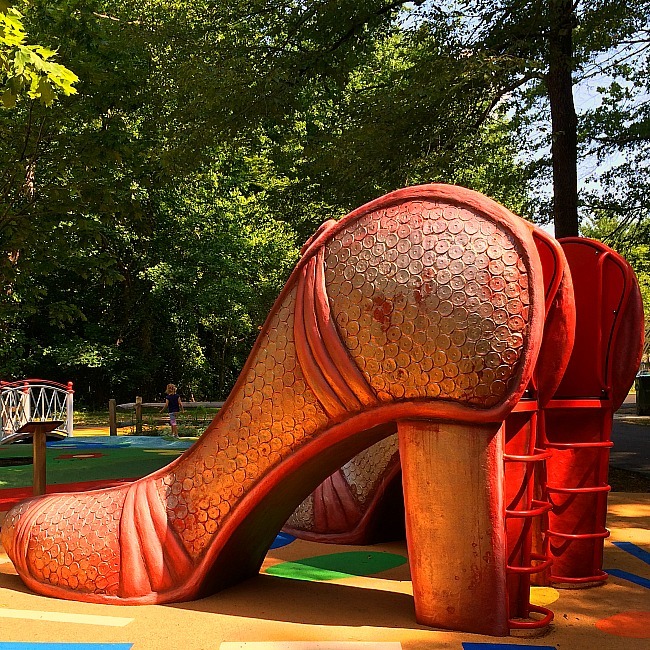 Watkins Regional Park is home to the Wizard of Oz Playground, the Horse Racing Playground, a Carousel, Miniature Train, an amazing Nature Center, Farm, and Mini Golf! 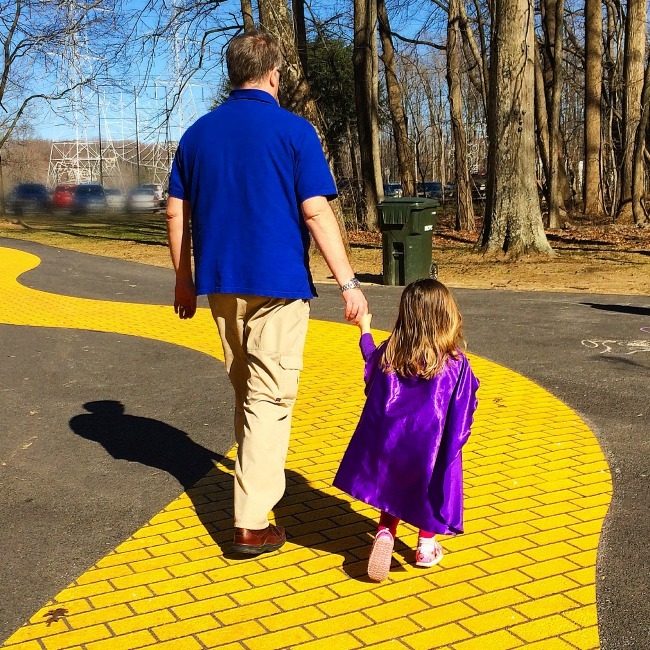 You can’t help but skip when you get to the edge of the yellow brick road. You will want to link arms and start singing about emerald cities and lions, tiger, and bears. 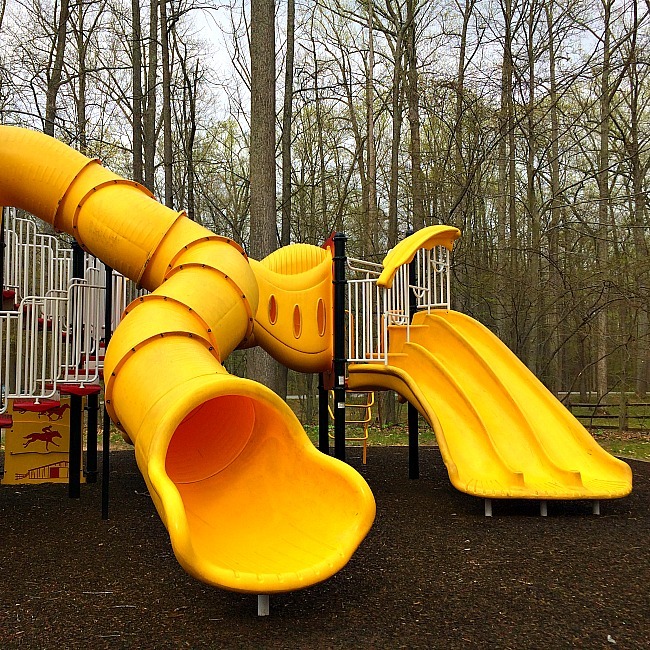 As a parent, you won’t stop grinning as your kids lose themselves in imaginative play… and then after an hour or so, you will realize that you have only scratched the surface of this fantastic family park. 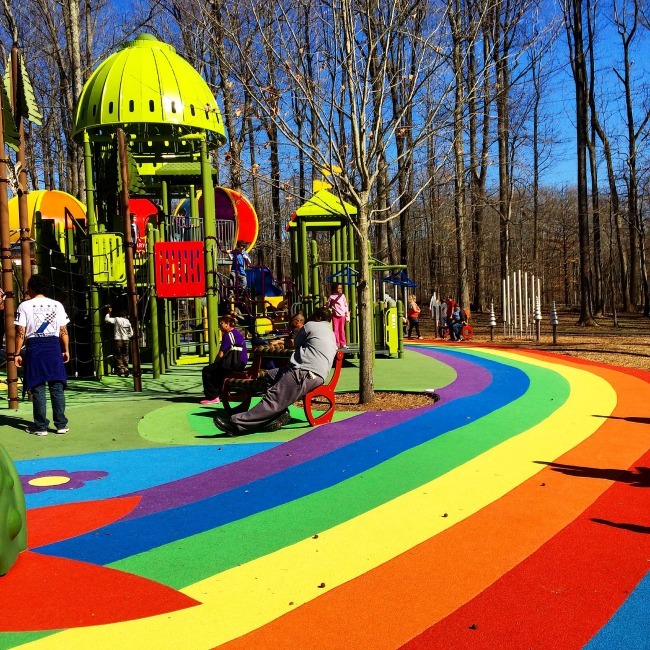 Watkins Regional Park in Prince George’s County is an obvious contender for ‘Best Park in Maryland’ because there is so much fun to be had for kids and families, much of it for free! 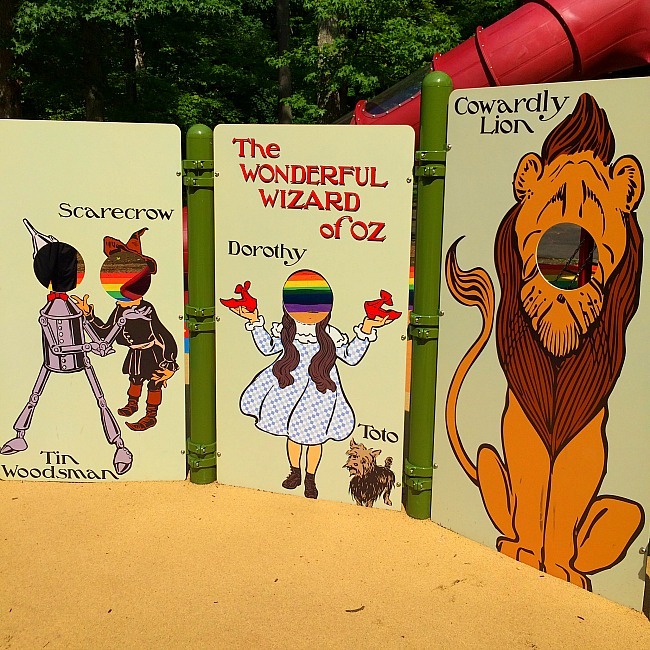 Many people have heard of the super cool Wizard of Oz themed playground and perhaps they doubt it could really be that awesome.. but it is. 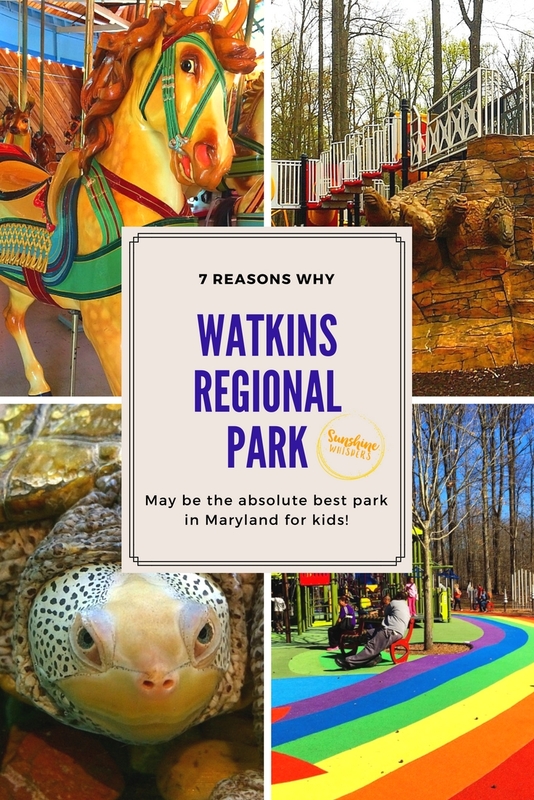 Even better though, is there are actually half a dozen other reasons, in addition to Maryland best playground, to love Watkins Regional Park. It’s a hard call of course because there are a few other parks in Maryland that could entertain a family all day. But Watkins Regional Park may very well be the best park in Maryland for kids. Here are seven reasons why. Follow the yellow brick road. Somewhere over the rainbow. We’re off to see the wizard, the Wonderful Wizard of Oz! You might have to pinch yourself, but rest assured you will most certainly not be in Kansas anymore. Prince George’s County really out did themselves with this playground. 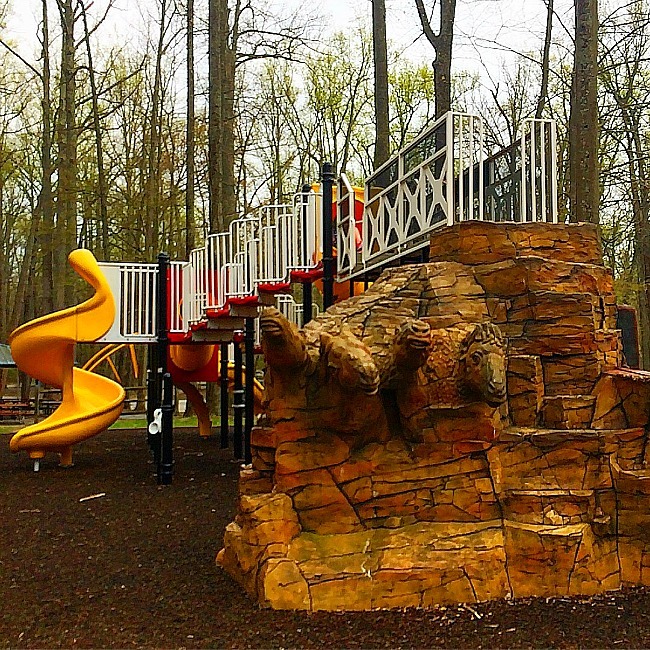 It is likely the best playground in Maryland, and may very well be one of the best playgrounds in the country. The imaginative theme is fantastic and it is combined with a large number of play elements that are just so, super fun! The main 5-12 play area is Emerald City. Another play area features Aunt Em’s house and the cornfields. There is an area for Munchkinland. You can slide down the Ruby Red Slippers and run around the rainbow track. Great care is given for detailing, including Toto’s dog house and an appearance from the Wicked Witch of the East. There are plenty of swings at this playground and even though the playground itself is not shaded, it is surrounded by a lovely, shaded picnic pavilion area. There are public restrooms both at the playground itself and the parking area. The playground actually starts at the parking lot with a paved yellow brick road (for real). This playground fills up fast but don’t stress out about it. If it looks too crowded, keep driving about 1/2 mile down the road (if that) and park at the large Nature Center parking lot. There is a shaded, paved path (great for strollers) connecting the Nature Center and playground. Across the street from the Wizard of Oz playground is a gorgeous carousel believed to have been built by Gustav Dentzel at the turn of (last) century. Called the Chesapeake Carousel, this lovely ride was located at Chesapeake Beach until 1972 when it was moved to Watkins Regional Park and restored to its present day glory. The carousel runs seasonally (generally May through September– check the website for details) and costs $2/$2.50 a ride for residents/non-residents. 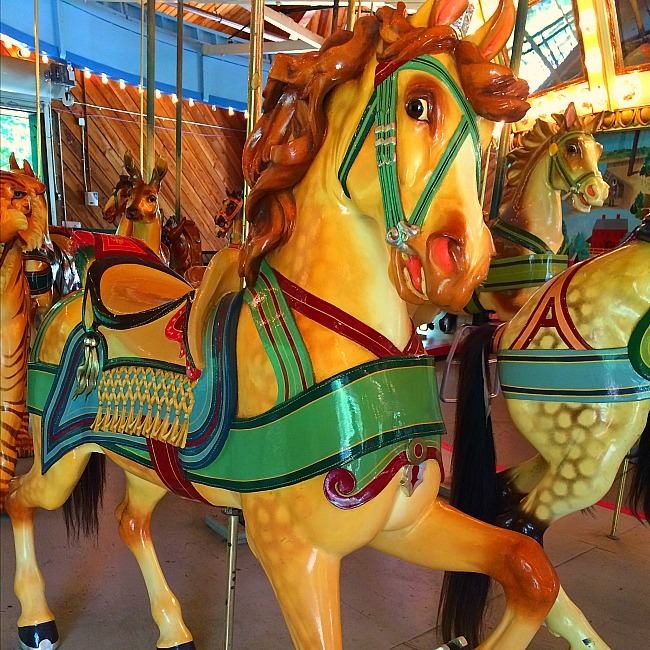 Literally right next to the Chesapeake Carousel is another delightful seasonal experience your kids will adore– a C.P. Huntington replica miniature train ride! This train is lovely as it meanders through the wooded area of Watkins Regional Park and through the Old Maryland Farm, where your kids can spy cows, pigs, and other farm animals. 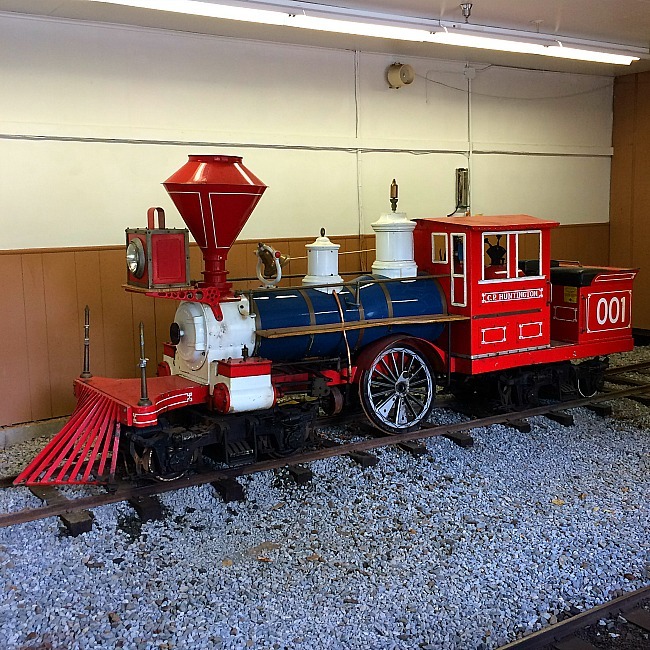 As with the carousel, the miniature train runs seasonally (generally May through September– check the website for details) and costs $2/$2.50 a ride for residents/non-residents. Generically referred to as Watkins Regional Park Playground #2, this hidden (well hidden) gem is an amazing playground in its own right. The only downside really is that it plays second fiddle to the Wizard of Oz playground. But if you know how to find it, you have the perfect play respite for when the more popular Scarecrow-inspired play areas are a bit crowded and overwhelming. 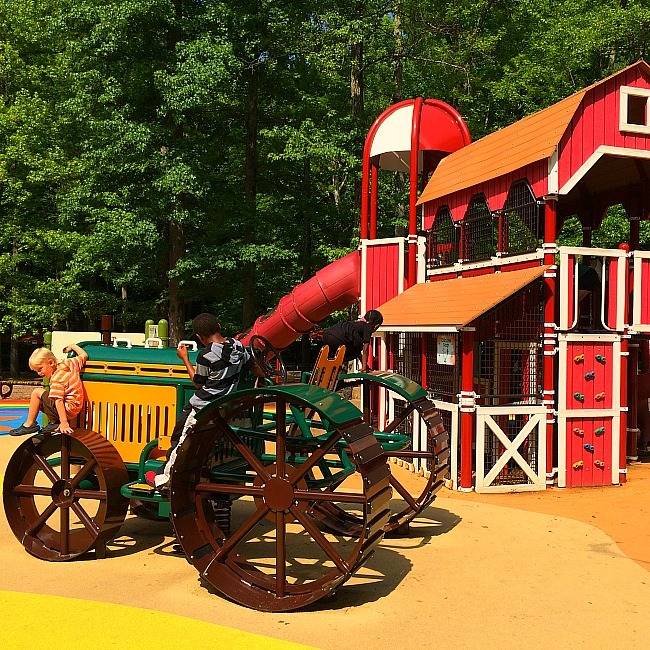 The Horse Racing Playground is another one of Prince George’s County Imagination Playgrounds (there are 25 in total) and is gorgeously themed. The main play structure looks like the starting gate of a horse race, albeit with a few super fun slides at one end, and a carving of 4 horses running at the other. This playground is nestled among a very well shaded picnic area, with tons of picnic pavilions and public restroom facilities close by. There is a themed toddler play area as well, with ride-on horses, and swings to accommodate toddlers, big kids, and kids with special needs. 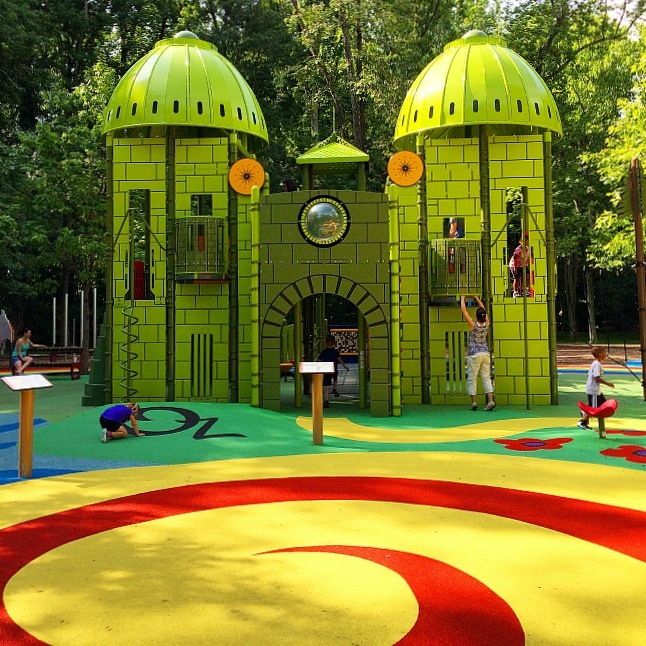 drive past the Wizard of Oz playground area as if you are headed to the Nature Center. Instead of turning left into the Nature Center parking lot, turn right toward the picnic area sign. Follow signs for the picnic pavilions. You will turn left and follow the road all the way to the end. (if you went straight I believe you end up at the park maintenance area). The playground is in the center of a roundabout area at the end of this road. 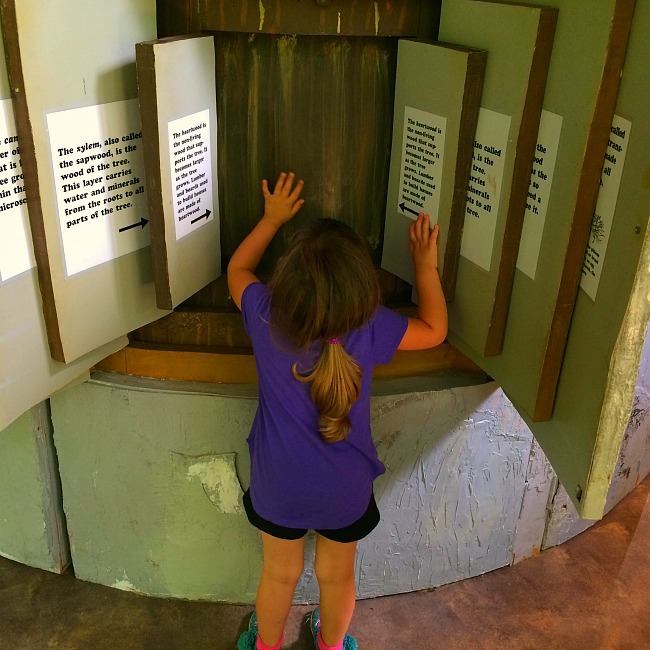 With a carousel, train, the Wizard of Oz, and other fun features, a side visit to a nature center might seem like an afterthought. You really don’t want to miss the Watkins Nature Center though. 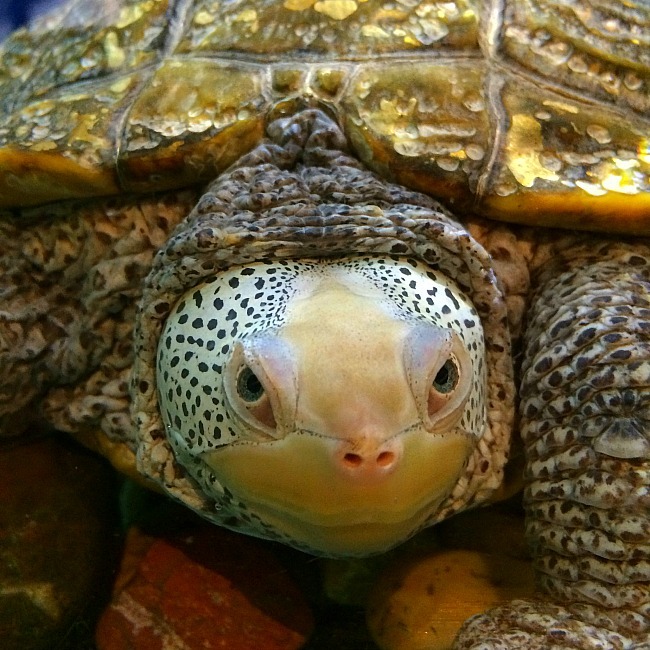 This Nature Center does a great job of letting kids get close to animals like turtles, snakes, toads and frogs, lizards, and even cockroaches. There is a barn owl and other birds of prey. Additionally, kids will get a kick out of the big tree and opportunities for sensory and imaginative play. Watkins Nature Center is open Monday-Saturday 830am-5pm and Sundays/Holidays 11am-4pm. As if you haven’t already spent all day at Watkins Regional Park, there is still more to do! There is a simple, but still super fun mini golf course located in the same area as the Carousel, Train, and Farm. 18 holes will set you back either $5 (residents) or $6.50 (non-residents). Old Maryland Farm is an agricultural educational farm. It is not a petting farm but your kids will still love getting close to animals such as chickens, cows, horses, peacocks, turkeys, bunnies, llamas, and ducks. There are a number of scenic walking trails throughout the park including one to a beaver pond. There are also indoor and outdoor tennis courts and ball fields. One of the great things about Watkins Regional Park is that it hosts a few very special annual events. Kinderfest in October– a HUGE children’s festival that pretty much takes over the park. Trash to Treasure Green Craft Fair– In November; run through the Nature Center. You can play all day for FREE at Watkins Regional Park (with the exception of extra add-ons). Watkins Regional Park makes a great day trip (you could literally spend all day here) but it also makes a great pit stop/halfway point if you are planning a trip to Southern Maryland. I hope you make plans to visit soon and I hope you have a wonderful wizard of a time!